If you’ve got a fresh ring on your left hand, the wedding planning process wheels are probably already turning in your head. Everything from getting your photographer nailed down to sending out Save The Dates to picking your venue and food—it’s a lot to digest. 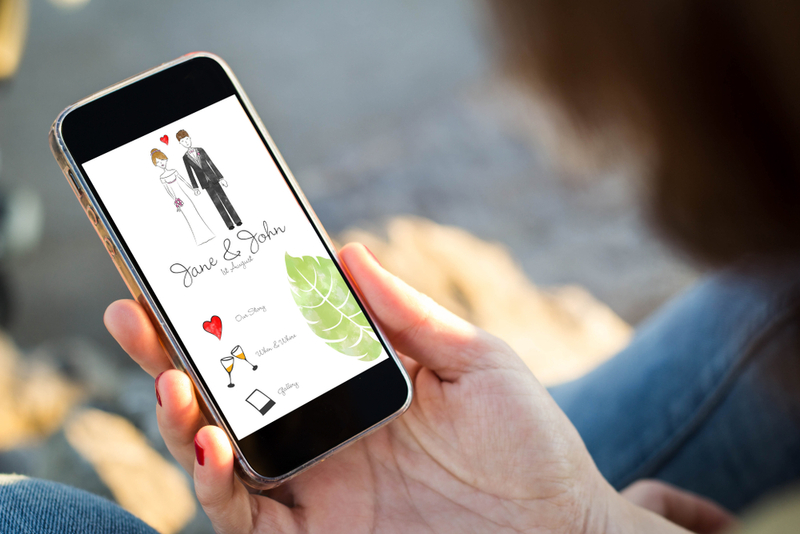 As you’re going broke and insane trying to put together all of the moving pieces that form a wedding, you’re probably fantasizing about the envelopes of cash and checks you’ll get to stuff in your bag on your way to the honeymoon. But… will you be able to count on those cash gifts, or are you going to be going on a budget beach trip to the Dominican Republic because all of his relatives insisted on buying towels, china, and pitchers? 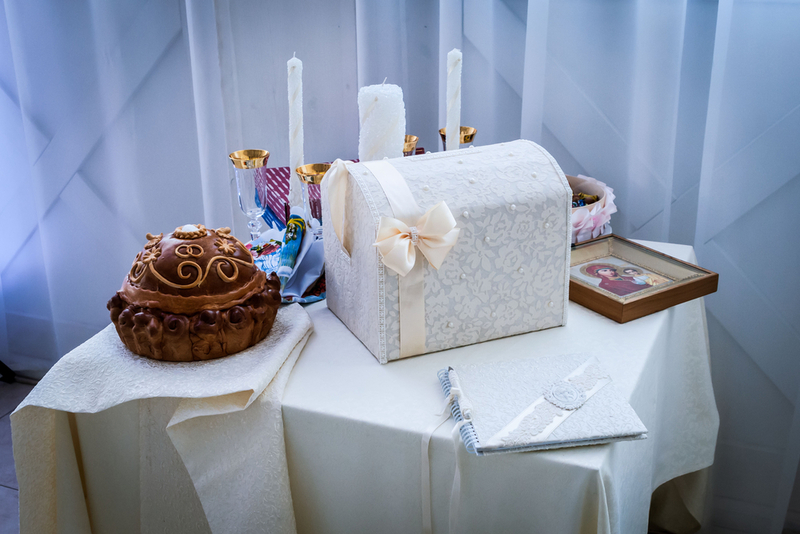 Cash gifts have evolved more as the “norm” in the last 20 or so years, since more couples are living together before tying the knot—sort of nixing the need for the traditional housewares associated with wedding gifts. According to The Atlantic, the practice of giving the bride and groom household gifts started way back in the Renaissance, when a bride would drag a hope chest with her down the aisle (I assume), full of things like brooms and fabrics and whatever the f*ck else was considered a household necessity in 1500 (maybe, like, also plague repellent). Depending where you live, you can expect a lot or a little in terms of cash for your wedding. Many Northeast U.S. folks treat cash gifts as the standard, but there are still plenty of hold-outs that still believe cash is tacky and gifts like irons and towels are the way to go (looking at you, Southeast U.S.). What’s a tactful way to ensure you do have a fistful of Benjamins and not a cabinet of useless sh*t after you say “I do” ? 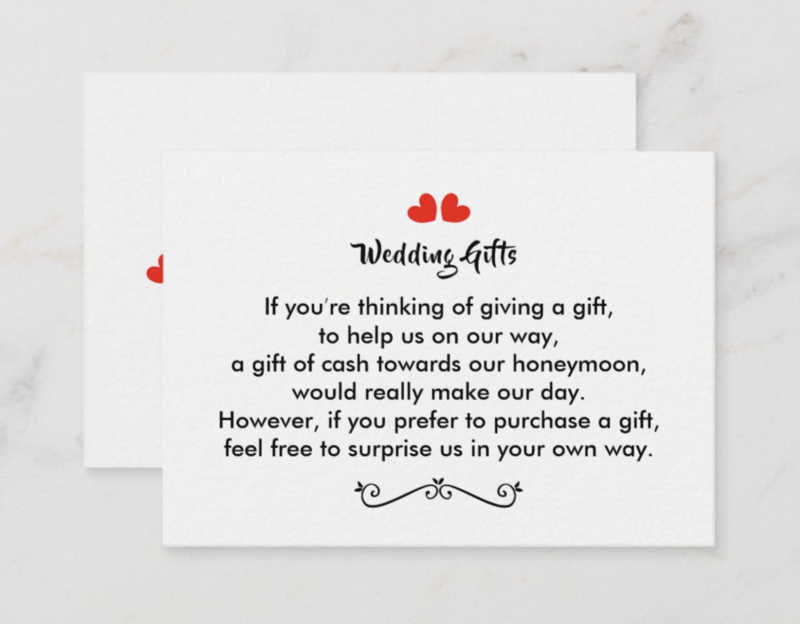 We scoured the internet and found stories and advice on the best and worst ways couples have kindly requested cash wedding gifts. We hereby present it to you as a guide to navigate getting that money, honey. First of all, yikes. Secondly, a way around literally hounding your guests for money is to simply nix the traditional registry altogether or have a very, very small registry with only a few gifts available. This subconsciously and politely sends the message that you’re in the market for envelopes and not a new king sheet set. If you’re planning on using cash and check for a honeymoon excursion, there are plenty of websites that host trip-specific registries so guests can pay toward activities, dinners, spa retreats, and whatever other activities you’re planning on taking part in. Honeyfund, for instance, breaks everything down for gift-givers depending what you, the bride and groom, have specified you want. From upgrading airline tickets to adding dinners to tacking on snorkeling adventures, guests can pick and choose how much and what they want to sponsor on your honeymoon. If you want to go a more intermediary route, Zola is an all-in-one registry that has the honeymoon registry pieces like Honeyfund, but also allows you to register for physical gifts so Aunt Diane feels better about being able to finally get those dish towels you need. You can even add options like putting a down payment on a house, so the options are endless and you can still get money. One couple on Reddit defied expectations by not being tacky and leaned on their ethnic customs to get around the whole asking-for-cash thing. 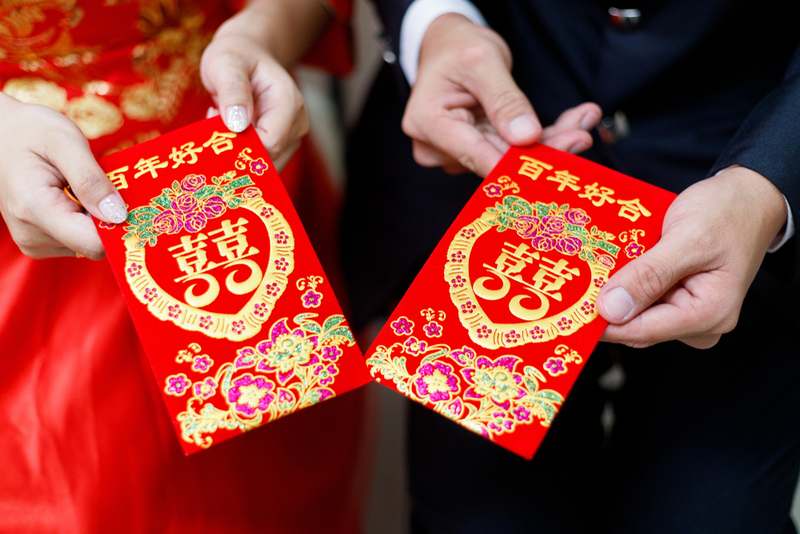 They wrote, “If you decide to give a gift, we prefer the Chinese custom of a red envelope, called hong bao, to help us start our lives.” Basically, the Chinese tradition of the red envelope with cash is twofold—it helps set the couple up financially, and it’s considered good luck. If you aren’t Chinese, you can put a note in the same vein on your wedding website. How do you do that without being déclassé or culturally appropriating? Add a personal touch. Perhaps you’re having a really hard time buying a house as a couple, or just invested a fixer-upper, or are going back to school, and that cash would go pretty far. Whatever the reason, giving your guests a story to connect to their financial contributions will make them feel better about just throwing dollas at you, figuratively. There are, obviously, much better ways to imply that you’re into the idea of cash money without saying, “B*tch better have my money” to grandma. One couple from Australia put in their invitation their regular registry, but additionally, noted that there’d be a “wishing well” at the reception. After some in-depth Googling, I found out that a wishing well is the equivalent of those boxes or birdcages for envelopes we in America love so dearly. Oh, Australia—so wise, so strange. Although I wouldn’t outright say, “hey, we’ll have a box for money in the cocktail area” you could say something on the RSVP card like “Check our wedding website for more information.” From there, you can explain whatever gift setup and/or birdcage you plan on having. This is still sort of tacky, but if you feel the need to spell it out, go for it. Since putting that you want cash in writing anywhere on a Save The Date or invitation is in bad taste, make sure your parents, future in-laws, and wedding party all know that you and your beloved would greatly prefer cash gifts over physical stuff. Chances are, aunts, uncles, grandparents, and close family friends are going to reach out and ask those folks anyway what you all want as gifts, and it’ll be gentler coming from mom and dad versus scrawled on the bottom of an invitation. Altogether, no matter what you do or how you do or don’t ask for cash, just make sure you’re taking notes on what not to do from that bride that demanded $1,500 per guest for her dream wedding.